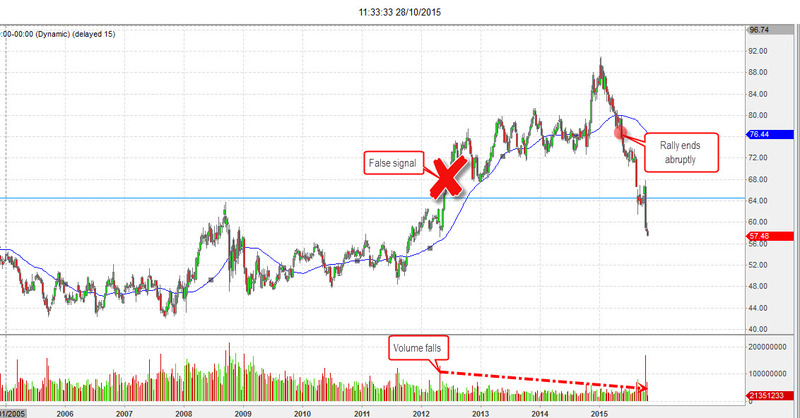 When I first time heard about the Cup with Handle chart pattern I was certain some coffee junkie had coined the name. I expected it to be some quick kind of trade you made first thing in the morning. You know, while you sipped your first cup of Joe. But to my surprise it’s got nothing to do with coffee, or even morning, for that matter. The Cup with Handle chart pattern is rather popular among swing traders. Now, it does require a lot more patience than many other patterns. But, if you get it right, it’s worth your while. Cup with Handle is a chart pattern that, to my knowledge, was developed by William J. O’Neil in the 1980s. The pattern is explained extensively in his book, How to Make Money in Stocks, which I personally recommend. The cup with handle is essentially a pattern that, as you’ve no doubt guessed, looks a lot like a cup with a handle. The illustration below should help with the visual. 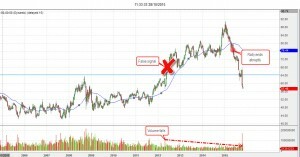 Generally, the cup with handle was designed to identify a buying momentum after hitting a bottom. Sort of an inflection point, for those of you that like math analogies. Once the pair bottoms out, it generates a U-shape pattern. That’s followed by a false attempt to break the high. Then, it falls back slightly to generate the handle shape. The forming of the handle is your cue to buy. If the cup with handle pattern was identified correctly, it should be followed by a long upward trend. Does that sound confusing? It might be a little but it’s certainly nothing you can’t (pun intended) handle. So how do we identify a real cup with handle? For that, several conditions must be fulfilled. The first thing is that the bottom should be a U-shape. Don’t kid yourself that a V-shape is good enough. An actual U-shape is very important. That’s because a V-shape signals a very quick rebound which doesn’t usually shake off sellers. Thus, the cup with handle pattern could be a false one. The bottom line is that a long U-shape is critical for the pair to bottom out. Next you need to watch volumes. One of the most important aspects of nailing the cup with handle is volume. 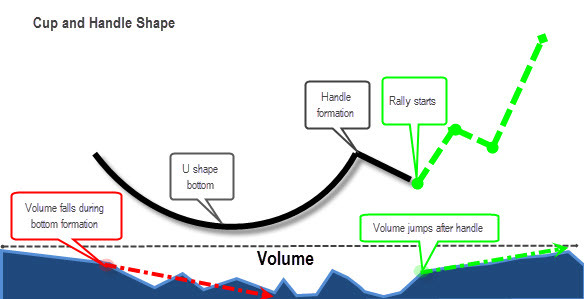 Trading volume should dwindle during the decline and formation of the U-shape bottom. This signals that sellers and speculators are out. Volume jumps up and then slides once again during the handle formation. When the pair makes that final break, volume should rise and stay high. That is the signal for high momentum. The Moving Average is also something you should keep an eye on. Understand that there is no magic number as to which moving average to use. For weekly intervals, I prefer to have at least a 20 week moving average to capture the trend. Overall, the decline precedes the bottom. And the bottom should be clearly under the average, as illustrated. Your buying cue comes after the handle that the pair/stock crosses above the moving average in tandem with rising volumes. Below you can see what an actual cup with handle looks like. You can also see how we identified the buy signal. And, of course, the most interesting of all, what the upside looks like afterward. Following a cup with handle can be very lucrative. But missing a false signal or failing to wait for the right one can cost you dearly. For example, take a look at the chart below. It’s a classic cup with handle, right? It looks like it… except that volumes didn’t rise in the bounce back nor did they in the breakthrough. Why? Because this was a false signal. The stock later collapsed, drowning those who had a long position with it. That last example was really very telling as regards this pattern. It tells you should be patient for all the signals to confirm a cup with handle. Otherwise, your trade could end very badly. Moreover, as you might have noticed, all the patterns we used are in weekly intervals. This is intentional; the cup with handle pattern tends to be the most effective in long term weekly trades. If you’re trading a CFD of an index and miss the volume data, there’s no need to worry. You can use futures data to obtain volumes. Or you can watch volumes on an ETF that imitates the index, such as the S&P500 and the SPY ETF. In conclusion, the cup with handle pattern can be highly lucrative. It’s very effective in identifying long term bullish trends. However, you need to be wary of the “false alarms.” Make sure you get an “all clear” before you jump in. Believe me. I do still have that o neill book on CAN SLIM strategies. this only applies for bullish market that only relates to Stock markets. Just be awe about this and I do still loose monies at the stock market especially with the William o neil book. Try to analyze the cup with the handle is one of the hardest to detect. Yes, it doesn’t lend itself to algorithmic detection very well. I don’t see an obvious way to code it. Wanna hear more stories on my experience upon stock trading that based on picking top stocks in industry, sectors- top eps and RSI such as eps of 99 and RS of 99??? trust me, I have failed to make monies on that fella. gotta laugh about this.